Some of the world's best beaches in some of the ultimate places to chill make this Thai Island Hopper trip a must. 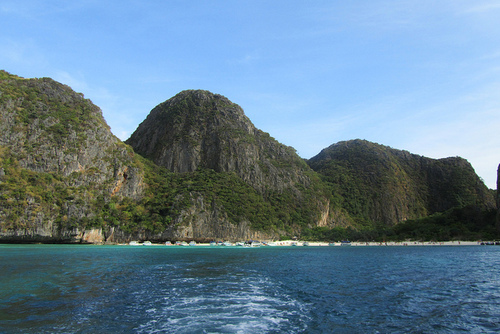 From busy Phuket, head to paradise on legendary Koh Phi Phi, before Krabi & its amazing scenery. 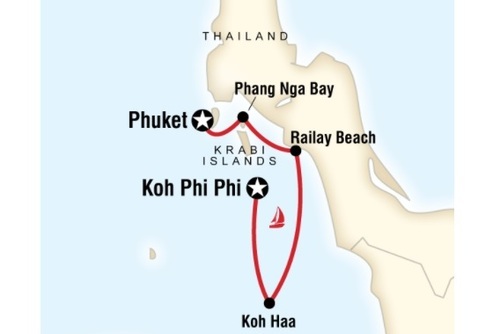 Our trip begins on Phuket, Thailand’s largest island. Check-in to your hotel & relax poolside or head to the beach. Tonight, you’ll meet with your Trip Manager & fellow travel buddies before heading out into the bright lights & buzzing atmosphere that this town is known for. Get into holiday mode as you discover Patong at night. Known for its great party vibes & many bars, clubs & discos, there’s something for everyone. Maybe try Bangla Road & see why Thailand is famous for the phrase of 'mai pen rai, meaning 'don't worry, be happy'! After breakfast, head down to the beach & pick a spot on the sand that will be yours for the day! You could try out some of the water sports on offer here. If you’re up for something different, you can check out the area at a different angle & explore the natural beauty of the coast in a sea canoe. A local guide will fill you in on the area as they take you through caves and along the dramatic coastlines. You could also take a trip to see an unusual limestone karst, Ko Tapu on Ao Phang Nga National Park, referred to as "James Bond Island" because it was made famous by a James Bond film. There are loads of other activities & sights here, so there’s something for everyone to enjoy. You could also see a different side of Phuket in Phuket Town; it’s known for its architecture & Chinese influences. You could visit the Jui Tui Shrine & ask the shrine’s oracle for advice. You can also get to the 45m (147ft) high Big Buddha that overlooks the island. There’s also your chance for something really different – a visit to the Gibbon Rehabilitation Project – an enterprise that is working to protect gibbons (small apes) & return them to the wild. The nearby Bang Pae Waterfall is a great place to cool off in the afternoon as well. When you’re in Thailand, there’s no better way to get amongst the local lifestyle than through the range of delicious food. From Pad Thai, to mouthwatering yellow, green & red curries, there’s something to tempt your taste buds. So as the sun goes down, find a little local place & sit down with a beer & relax. You can take it up a notch later, there are loads of bars, shows & clubs to enjoy here, so ask your Trip Manager for some tips on where to head. 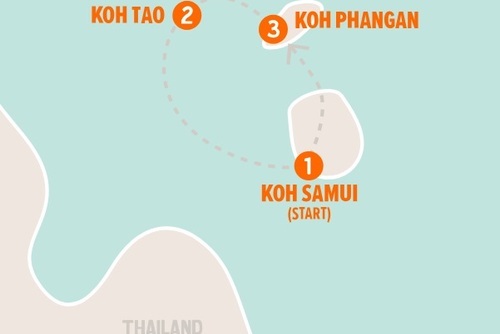 This morning, maybe grab another delicious meal or fit in some last minute time in the sun before we depart on a ferry for one of Thailand’s most famous islands, Koh Phi Phi. On arrival, your Trip Manager will show you all the local sights, so you can get your bearings & get ready for some good times on the island. Made famous by the film ‘The Beach’ it’s a picturesque place with loads to enjoy. With two free days, get into all that this fantastic place has to offer. From beaches to boats to food, it’s all here & ready to be explored. If relaxing on island time is what you’re after, find a section of Phi Phi’s beach, put down your towel & work on your tan. But there are loads of other things to see & do here. Maybe jump on a boat for a look at Maya Island before the tourists arrive. Today, there’s a cool optional activity for you to experience – a cruise around Phi Phi Island that takes in some of the island's hot spots. 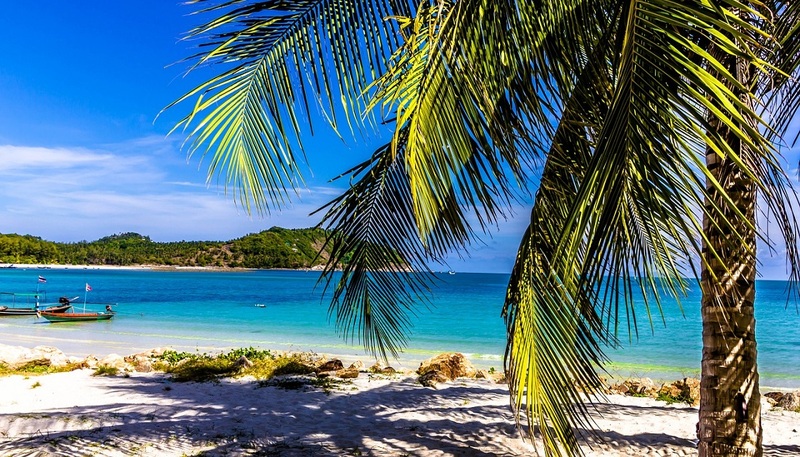 You’ll cruise to Maya Bay, home to “The Beach”, for a swim or a stroll on the sand at Monkey Beach, which is famed for its cute furry inhabitants & some snorkeling off Bamboo Islands reefs while looking for “Nemo”. Chill out in the sun before a truly incredible experience – we’ll head up to the highest viewpoint on the island for some amazing views where we’ll watch a gorgeous sunset over the Andaman Sea. Later, you could enjoy a beer at a beachside bar or chill out with some locals & soak up the vibes. Some free time in the morning before we farewell Koh Phi Phi. This afternoon it’s a change of pace as we take an afternoon ferry to Krabi. Nestled amongst limestone karts, Krabi offers some amazing scenery, friendly locals & cute small town feel. 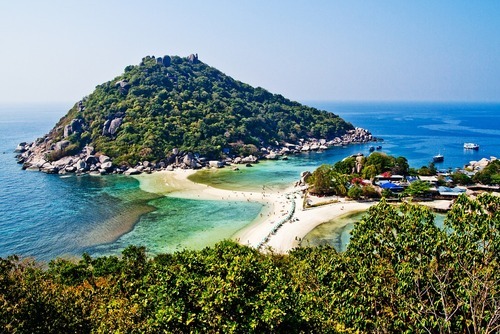 With it’s beautiful beaches & unspoiled islands, it’s now one of the most famous tourist destinations in Thailand. 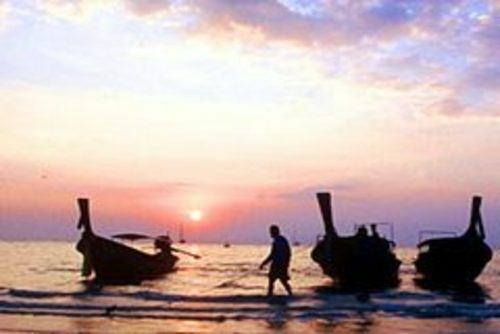 On arrival we’ll head to the well known beach of Ao Nang, a small beach town. Maybe head to the beach for a massage or take a walk through the town for a look at the local life here. 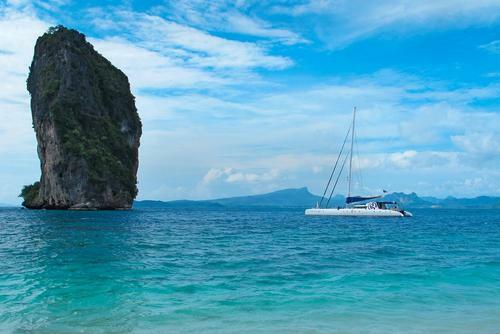 Wake up to a day of good times in Krabi & take advantage of the many things to see & do here. If you are feeling active, you may want to visit the Tiger Cave temple. Though the tigers have long since left, this Buddhist temple provides some great photo opportunities – especially from the viewpoint at the top of 1260 steps! If it is a quiet beach that you are after, then jumping on a long-tail boat & making the journey to Rai Leh beach is where you want to go. Only accessible by boat, this small island, surrounded by dramatic rocky cliffs is the perfect place to relax. You could head to West Rai Leh Beach for a look at the town – take a walk along the short promenade lined with restaurants & shops & stop for a tasty lunch or a beer along the way. 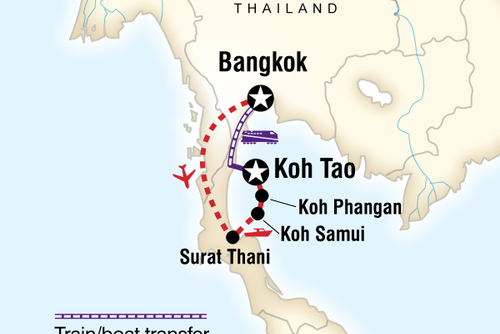 Our journey returns us to Phuket where our Thai Islands trip ends. You can choose to take a free transfer to Phuket airport or the Sawaddi Patong Resort where our trip started. I went on the Thailand Island Hopper tour in Phuket. I will start by saying that I went into my trip a little hesitant. I wasn’t sure how I felt about going on a group tour with a bunch of people I didn’t know. Was I going to be stuck with them the entire time if they turned out to be awful? Was I going to be stuck doing things I didn't care for? I really just didn't know what to expect. The day the trip started we had our first meet up. It was to discuss the trip, optional activities, and to get familiar with the group. When choosing my activities I was torn on what to do. Do I do all of them? Is it too much? Am I going to wear myself out? Well I signed up for basically all of them. (Minus a cooking class cause the last thing I wanted to do on vacation was cook) And let me tell you I was SO glad I did all of them. My group included about 30 people. Our tour manager was awesome. The people were awesome. We all had the most amazing time. All 30 of us became instant friends. Even on our “free days” our tour manager had some stuff he planned to do which we were all welcomed to do as well if we wanted. We usually did them and for the most part stuck together. Every single aspect of this trip was amazing. I still speak to most of the people from that trip. I have even been lucky enough to meet up with them on different travels. If you are thinking about doing this or any other Contiki trip STOP THINKING ABOUT IT. DO IT!! You absolutely will not regret it. There is only one regret I have from this experience. And that's the fact that I didn't do it sooner.